This blog is a part of the DSO model series. 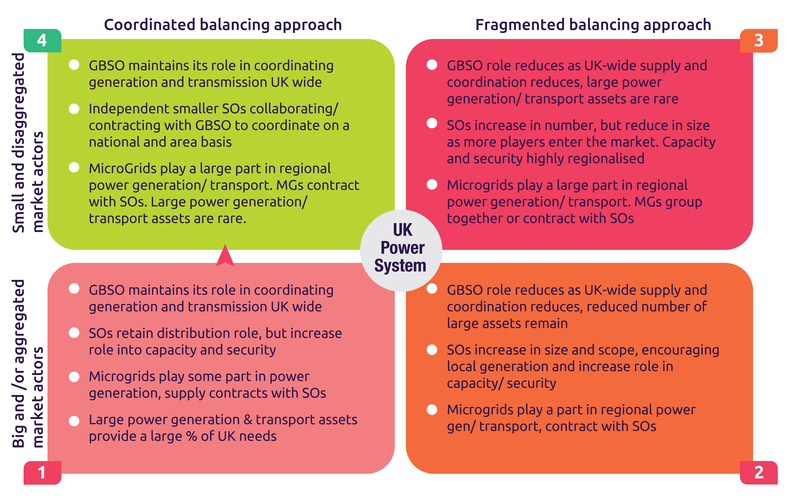 You can read the previous blog about how the nature of the UK power industry is changing (blog 1), about the challenges and solutions for the DSO role (blog 2), about the benefits of a separated system operator (SO) (blog 3), what this separation will actually look like (blog 4), and about and the full range of DSO responsibilities (blog 5). In this blog, we will look at the next steps to deliver transformational change in the UK power industry. The GBSO will continue to coordinate balancing activities across the country, working with the SOs and AOs for the good of the whole transmission and distribution systems. The SO will be required to provide system balancing services to the GBSO, providing it does not interfere with the needs of the SO’s customers. Therefore, the SOs will need to coordinate across boundaries to assist each other in supporting the GBSO. Beneath the level of GBSO-SO coordination, the model becomes quite different. When the DSO splits, an obvious step from government will be to put the SO role out to tender to bring new entrants into the sector, introducing fresh ideas and innovation. This model is both a threat and an opportunity for the SO as it will need to defend its existing operating areas while simultaneously looking for expansion. Innovation will become a premium in the face of new entrants and business strategy will need to be developed to exploit the wider opportunities created through this model. In addition, contracting for SO areas opens up the possibility of setting up joint ventures with other organizations. Given the requirement for SOs to coordinate on some solutions this would need to be carefully managed and the willingness to collaborate would have to be one of the key regulatory measures to keep the collaborative-competitive balance. This will be a complex challenge for the regulator, as to demonstrate its suitability to manage more and wider SO areas an SO would have to demonstrate its ability to collaborate with other SOs, where necessary, for the public good. The regulator must be able to assess the effectiveness of services within the distribution network, and the relative cost and the opportunity cost of changing an SO before an area could be put out to tender. The existence of enough competitors is essential for the development of an efficient market. In the initial term the existing DSOs would provide sufficient competition, but there is no reason that new entrants couldn’t gain market share. The most efficient number of firms depends upon economies of scale: splitting into too small units leads to inefficiency of investment, so the regulator would have to review this periodically. Given that this is an historic shift in the landscape of the distribution system, DNOs should continue to engage proactively with Ofgem and BEIS to set out their point of view, with the aim of influencing the change rather than simply having it imposed on them. As part of their DNO-DSO journey, DNOs should weave in the principles of AO-SO independence in readiness for separation. DNOs should be examining their skill base for gaps identifiable from the activity lists above. 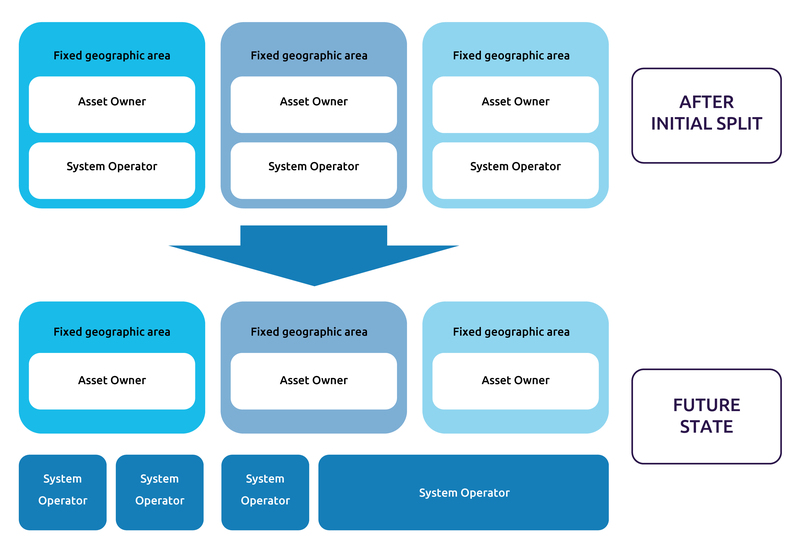 For example, areas such as market facilitation are new to DNOs and it is likely that these will need to be addressed to ensure that they can position themselves as the natural early owners of the DSO role – and that they are best placed to maintain both AO and SO roles after the split. Given the nature of some of the new services and activities DNOs should also be examining their risk-reward appetite. Some of the activities will not have a clear income and profit position, as they are still in early definition, and the DNO must establish where they wish to invest to protect market share and access new income streams as the market and system evolve. Ofgem and BEIS should be issuing statements around their thinking on AO-SO separation, as the longer it remains speculative rather than a firm destination, the longer it will take to realize. At present, DNOs are working towards RIIO2 and the already nebulous DSO journey, so some clarity at an industry level would be well received. The direction of travel should be set now, be clear and explicit. However, the introduction of the AO-SO model must be an evolutionary element of the DNO-DSO journey, and the future state shown in the model above may be reached in the late 2020s. This being the case, DSOs should be free to develop their commercial offerings and other innovations prior to any actual legal separation. The power system in Great Britain is changing rapidly. DNOs have already started to become embryonic distribution system operators (DSOs), carrying out limited DSO services, and this trend will accelerate. To survive the transformational change ahead they must begin to reorganize into distinct AO and SO businesses. It is likely that the nature of the future SO will change beyond all recognition from where we are today. It is essential that DNOs act now if they are to take control of their future.